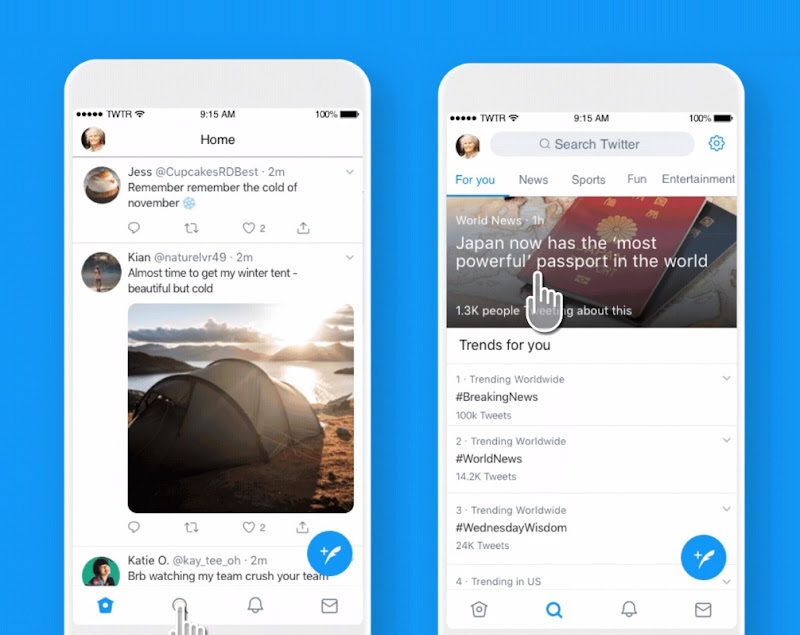 Twitter recently announced a few changes in its app for iOS that adds a section to the interface. According to the company’s spokesperson, the new section features will show tweets that the user cares for the most. "Just got an upgrade. We added sections so it’s easier for you to see the Tweets you care about the most, starting today in the US. ", informed Twitter in a tweet. Up until now, the Twitter for iOS included a search tab that offered only a vertical list of the most popular or trending topics. However, from now on, you can also scroll horizontally and view the trending tweets in different categories. For example, the new updated version includes a “For you” section that shows tweets, which the Twitter bots think, are the most relevant for the respective user. Categories for Current News, Sports, Entertainment, and many more are available along with stories and tweets for the same. The updated iOS version of Twitter is rolling out from today in the United States. However, if you don't see the new interface on your device yet, do not worry: it might take some time but eventually, you will experience it soon as well.